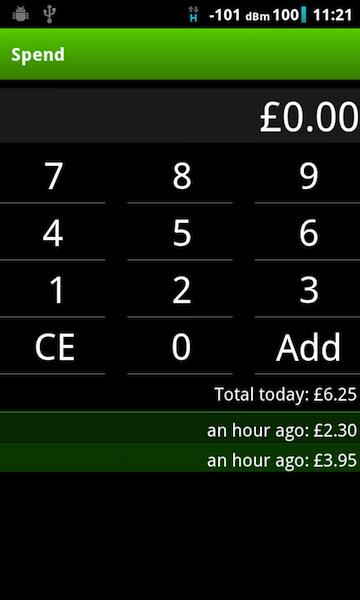 Here's a preview of a really simple Android app I'm working on, called Profligate Spending. I am working on a tight budget at the moment, and I need to keep track of my discretionary spending (something I'm quite bad at). This is the app I'm going to use to do it. When it's done, you'll be able to enter a maximum spend for the day, week, or month. When you buy things you'll put the amount into the app, and it will then tell you whether you're going over budget or not. It will remember previous days' spends, so you can save up for large purchases. The "put the amount into the app" part is where all finance tracking apps fall down, because nobody wants to do that. I am making it as frictionless as possible: entering small amounts is five presses (one to launch the app, three to enter an amount in pence, and one to add it). Still, I think it requires a motivated user. If you have any ideas for apps like this, let me know. It's a pity my first non-work app is for something as dull as personal finances, but, well. Actually, the more fun I can make it, the more I will use it -- so please send any ideas about that my way, too.